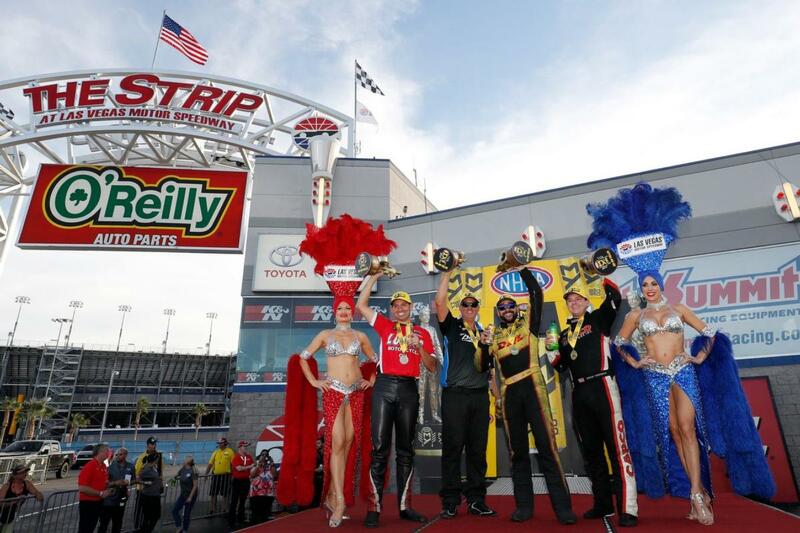 Torrence continued his impressive pace in the NHRA Mello Yello Drag Racing Series Countdown to the Championship, where he has yet to lose a round of racing since the playoffs began. He earned his first world championship during the semifinals when he defeated Richie Crampton. Torrence went on to get his fifth consecutive win when he bested Leah Pritchett with a run of 3.751 seconds at 326.32 mph in his Capco Contractors dragster. "This is a lifelong goal right here," Torrence said. "All the glory goes to God, my mom and dad, because without them none of this would be even be possible. Every one of those Capco boys on that race team, because they put their heart in it, and it is hard to beat people with heart. "All the boys back home at Capco, we got it done guys. This is unreal. To all those people who said we couldn't do it, we are here." 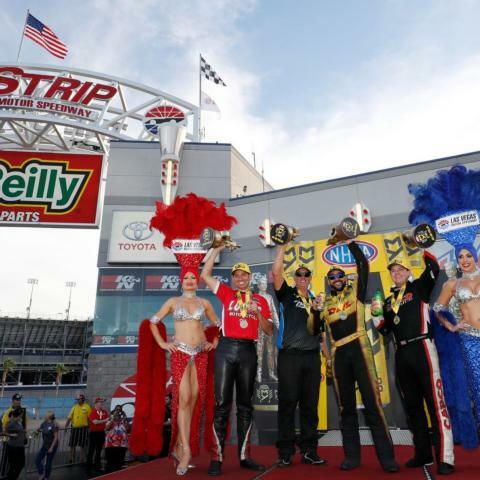 In Funny Car, Todd powered to his fifth win of the year in his DHL Toyota Camry and in doing so, took over the category points lead. He defeated Matt Hagan in the finals with his winning run of 3.921 at 318.39. He now has a 74-point lead over defending World Champion Robert Hight, who had a first-round loss. It was the seventh Funny Car win for Todd, the 16th in his career and completed a season sweep at the facility. "It is so awesome to drive a car like that when it is that consistent," Todd said. "You don't have to worry about if you are going to have to go out there and pedal it or things like that. You can go up there and smack the tree as hard as you can and keep that thing stuck down the groove. "It is a lot of fun to drive. We still have some unfinished business in Pomona. Hopefully we can go there and come out of it with two trophies." Butner, the 2017 Pro Stock world champion, grabbed his second win of the year after defeating Erica Enders with a run of 6.657 at 207.43 in his Jim Butner's Auto Chevrolet Camaro. It was his fifth final round at the facility in the past four seasons. "We started off like gangbusters, win in Pomona, ran good at Gainesville and thought we had another repeat deal coming," Butner said. "We struggled a little bit, as every team does. I kept saying this weekend this is perfect. "This car showed improvement every run. I'm very happy we got to win again, win a couple of rounds, much less win the race. This Pro Stock deal is amazing. Everybody in the top 12 qualifiers can win." Points leader Tanner Gray settled for a semifinal finish when he was defeated by Enders. He has a 140-point lead heading into the final race of the season. In Pro Stock Motorcycle, Arana Jr. was the top qualifier for the event and won his third race of the year when he defeated defending World Champion Eddie Krawiec in the finals. On his Lucas Oil Buell, he raced to a winning run of 6.885 at 193.35 for this 14th win in his career and his first at The Strip. "We did a great job qualifying, and that sent the tone for today," Arana said. "It gave me the confidence I needed. I had great lights in qualifying and did it again today on race day. "Great preparation and everything came back together. We just want to qualify well, win rounds and win races." With the win, Arana moves to fourth in the points and trails points leader Matt Smith by 64 markers. Krawiec jumps to second, only four behind Smith, and L.E. Tonglet is third, 61 out of first. Mike Janis won his first E3 Spark Plugs NHRA Pro Mod Drag Racing Series presented by J&A Service world championship at the season-ending event during the NHRA Toyota Nationals. Janis was the points leaders entering the weekend, but was defeated in the first round of eliminations by Mike Caruso. Rickie Smith, who was second, advanced to the quarterfinals and had an opportunity to win his fourth championship if he advanced to the semifinals. However, Smith was defeated by Rick Hord, allowing Janis to claim the crown. "It hasn't set in yet," Janis said. "After losing in the first round, we were all kind of down. Now, it's just an incredible feeling, I can't explain it. We had a good car all year, we had a good car when we got here and made nice and consistent runs. "It will sink in in the next hour or so. I've won races before, but this is the cream of the crop right here. The NHRA Pro Mod champ, I love it." In the finals, Sidnei Frigo faced Mike Castellana for the last victory of the year. Frigo was able to race to the win with a run of 5.756-seconds at 256.50 mph to the trailing run of 5.861 at 249.49 for Castellana. It was the first win of the season for Frigo. "We had a lot of issues with the car at the beginning of the year," Frigo said. "Now we fixed the car, and it runs great. Next year is going to be a good year." Steve Torrence; 2. Leah Pritchett; 3. Richie Crampton; 4. Tony Schumacher; 5. Blake Alexander; 6. Clay Millican; 7. Brittany Force; 8. Billy Torrence; 9. Antron Brown; 10. Troy Buff; 11. Terry McMillen; 12. Scott Palmer; 13. Greg Carrillo; 14. Doug Kalitta; 15. Shawn Reed; 16. Mike Salinas. J.R. Todd; 2. Matt Hagan; 3. Jack Beckman; 4. Bob Tasca III; 5. Ron Capps; 6. Courtney Force; 7. Shawn Langdon; 8. Tommy Johnson Jr.; 9. John Force; 10. Cruz Pedregon; 11. Jim Campbell; 12. Robert Hight; 13. Jonnie Lindberg; 14. Tim Wilkerson; 15. Richard Townsend; 16. Jeff Arend. Bo Butner; 2. Erica Enders; 3. Tanner Gray; 4. Matt Hartford; 5. Jason Line; 6. Drew Skillman; 7. Deric Kramer; 8. Jeg Coughlin; 9. Greg Anderson; 10. Alex Laughlin; 11. Chris McGaha; 12. Vincent Nobile; 13. Kenny Delco; 14. Steve Graham; 15. Fernando Cuadra; 16. Alan Prusiensky. Hector Arana Jr; 2. Eddie Krawiec; 3. Hector Arana; 4. Andrew Hines; 5. Chip Ellis; 6. Matt Smith; 7. Angelle Sampey; 8. Jerry Savoie; 9. L.E. Tonglet; 10. Steve Johnson; 11. Scotty Pollacheck; 12. Ron Tornow; 13. Ryan Oehler; 14. Kelly Clontz; 15. Mark Paquette; 16. Angie Smith. Sidnei Frigo; 2. Mike Castellana; 3. Rick Hord; 4. Jose Gonzalez; 5. Michael Biehle; 6. Jim Whiteley; 7. Marc Caruso; 8. Rickie Smith; 9. Jeremy Ray; 10. Shane Molinari; 11. Mike Janis; 12. Clint Satterfield; 13. Steve Jackson; 14. Chad Green; 15. Steven Whiteley; 16. Todd Tutterow. Steve Torrence, 3.751 seconds, 326.32 mph def. Leah Pritchett, 5.317 seconds, 148.85 mph. J.R. Todd, Toyota Camry, 3.921, 318.39 def. Matt Hagan, Dodge Charger, 4.087, 263.62. Bo Butner, Chevy Camaro, 6.657, 207.43 def. Erica Enders, Camaro, 6.652, 206.57. Hector Arana Jr, EBR, 6.885, 193.35 def. Eddie Krawiec, Harley-Davidson, 6.911, 195.05. Sidnei Frigo, Chevy Camaro, 5.756, 256.50 def. Mike Castellana, Camaro, 5.861, 249.49. Joey Severance, 5.266, 275.28 def. Julie Nataas, 5.369, 271.95. Sean Bellemeur, Chevy Camaro, 5.517, 264.65 def. Doug Gordon, Camaro, 5.488, 269.24. David Billingsley, Chevy Camaro, 8.268, 148.48 def. Doug Engels, Dragster, Foul - Red Light. Justin Lamb, Chevy Cobalt, 8.766, 150.58 def. Jimmy DeFrank, Cobalt, 9.102, 148.56. Chris Stephenson, Pontiac Firebird, 11.221, 112.78 def. Jeff Taylor, Chevy Camaro, 9.501, 139.66. Kevin Wright, Dragster, 9.044, 175.05 def. Ken Mostowich, Chevy Camaro, Foul - Red Light. Matt Blodgett, Chevy Nova, 10.057, 134.93 def. Rob Willis, Pontiac Firebird, 10.042, 165.13. Torrence, 3.751, 326.32 def. Pritchett, 5.317, 148.85. Todd, 3.921, 318.39 def. Hagan, 4.087, 263.62. Butner, 6.657, 207.43 def. Enders, 6.652, 206.57. Arana Jr, 6.885, 193.35 def. Krawiec, 6.911, 195.05. Frigo, 5.756, 256.50 def. Castellana, 5.861, 249.49. Steve Torrence, 2,718*; 2. Clay Millican, 2,487; 3. Tony Schumacher, 2,454; 4. Leah Pritchett, 2,394; 5. Brittany Force, 2,302; 6. Antron Brown, 2,291; 7. (tie) Doug Kalitta, 2,259; Mike Salinas, 2,259; 9. Terry McMillen, 2,253; 10. Scott Palmer, 2,182. *Clinched world title. J.R. Todd, 2,553; 2. Robert Hight, 2,479; 3. Ron Capps, 2,388; 4. Tim Wilkerson, 2,367; 5. Tommy Johnson Jr., 2,362; 6. Courtney Force, 2,324; 7. Matt Hagan, 2,321; 8. Jack Beckman, 2,283; 9. John Force, 2,277; 10. Shawn Langdon, 2,204. Tanner Gray, 2,583; 2. Jeg Coughlin, 2,443; 3. Erica Enders, 2,434; 4. Drew Skillman, 2,413; 5. Vincent Nobile, 2,404; 6. Jason Line, 2,350; 7. Greg Anderson, 2,334; 8. Bo Butner, 2,300; 9. Deric Kramer, 2,220; 10. Chris McGaha, 2,135. Matt Smith, 2,479; 2. Eddie Krawiec, 2,475; 3. LE Tonglet, 2,418; 4. Hector Arana Jr, 2,415; 5. Jerry Savoie, 2,378; 6. Andrew Hines, 2,366; 7. Angelle Sampey, 2,268; 8. Angie Smith, 2,255; 9. Steve Johnson, 2,242; 10. Scotty Pollacheck, 2,209. Mike Janis, 770; 2. Rickie Smith, 763; 3. Mike Castellana, 725; 4. Steve Jackson, 659; 5. (tie) Chad Green, 610; Jeremy Ray, 610; 7. Rick Hord, 565; 8. Khalid alBalooshi, 558; 9. Todd Tutterow, 521; 10. Jose Gonzalez, 510.